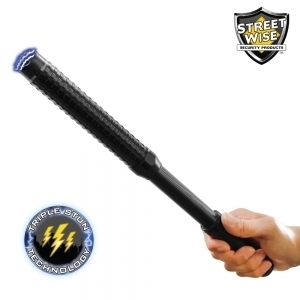 The patent pending Streetwise Attitude Adjuster 9,500,000* Stun Baton is the world's first adjustable stun baton. This unit incorporates a military grade aluminum that makes this baton nearly indestructable, and with the extended 17" you will be far enough from your attacker to make contact but remain safe. It also includes an ultra bright tactical flashlight and powerful stun so you will be prepared for any situation you may face. Adjusts from 13" to 17": With a quick twist of the handle, you can adjust this unit to any desired length between 13" and 17". 3 light modes: There are three light strengths (maximum, medium, and low). When the situation does not require maximum light strength, the other two settings can be used to extend battery life. The strobe light mode can momentarily blind an attacker and can signal for help in an emergency. Long Reach: At up to 17 inches long, this tactical baton is long enough to keep you a safe distance away from your attacker. And when retracted to 13 inches it is short enough to easily carry with you in the included holster. Heavy Duty Nylon Holster: To make it easier to carry, a heavy-duty holster with belt loop is included. *Actual Voltage output is difficult to measure and verify, but this unit compares to other brands that claim to be 9,500,000 or more volts.